You think hockey players nowadays are tough? Check out this story from C. Michael Hiam's new book Eddie Shore and that Old-Time Hockey. Hiam is describing run-in between a young Eddie Shore - with "a reputation of being afraid of nothing" - and Billy Coutu - described as "simply vicious." Coutu singled out the young Shore, but, to the amazement of many onlookers, Coutu took the worst of it, hit so hard by Shore it was as if Coutu was hit by a truck. We'll let Hiam, with quotes from Shore himself, tell the story from here. "The victor, however, did not emerge from the encounter unscathed. Shore was bleeding profusely because Coutu's head 'had smashed into my ear and torn it off. There was just a little piece of skin holding it on." The Bruins team doctor told Shore there was no way to reattach it. Shore calmly wrapped his head, put on his street clothes and spent the better part of the day visiting medical clinics searching for a doctor who would do the procedure. "Shore made the rounds of the medical offices in the city. 'They all said just what the doctor told me,' he later recalled. 'It was not possible to save the ear. Just before office hours for the day ended, I ran across a fellow who was more encouraging. He asked me what type of anesthetic I wanted. I told him just to give me a small mirror. That way, I could watch the kind of stitching he did. I made him change the very last stitch. If I had not done that, he'd have left a scar. I told him I was just a farm boy who did not want his looks messed up." 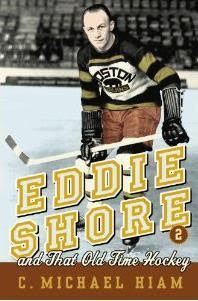 Hiam's book Eddie Shore and that Old-Time Hockey is full of little stories like that, making his Shore biography a fun adventure. It was a different time with some crazy characters, and Hiam tries his best to bring it all back to life. An Eddie Shore biography is long overdue, and comes with high expectations. The problem is, and the reason why no one really has properly written about Shore before, is many of the details are near impossible to find if not lost forever. Written records of Shore's youth and early career are pretty sparse at best, and first hand accounts are long gone. Hiam does his best to bring to life the legend of Eddie Shore, an unenviable task. Shore was a very complex man who, if he is remembered at all nowadays, it is for his oddities as Don Cherry's coach in the minor leagues or as a mythic roughian thanks to Slap Shot movies. Hiam does a good job in truly bringing to life the real Eddie Shore given the lack of material to work with. It is truly a shame that there was not more to work with, as any emotional attachment to our main character is slow to build and at best fades in and out over the course of the book. Which may have been how most of Shore's teammates experienced "The Galloping Cowboy," anyways. He was very much a loner and he did not spend much time with his teammates off of the ice. This made it hard for teammates to really get to know him. They may not have tried to hard, either, given how obsessive he was about hockey but also his other pursuits in life. Hiam does provide hockey book fans with the best biography of the 2010 hockey book season, although in all fairness I have yet to see the Bob Probert autobiography Tough Guy. One area aspect of the book that is a true treat is Hiam's attention to the era's other stars and especially it's characters. The stories shared of the likes of Sprague Cleghorn, Ching Johnson, Lionel Hitchman, King Clancy, Nels Stewart and others are fun reads for modern fans and hardened historians alike. Hiam bulks up the Shore biography with these period tie-ins. It is a nice treat. Many of the stories will amaze you. Especially the tales of the violence. If you think today's game is too violent, try reading just the back cover. You will instantly realize how much cleaner today's game is. You will quickly realize all the oldtimer's talk about today's game lacking the respect for the fellow player like in the old days is a bunch of hogwash. There is a spattering of black and white photos through out the book. And the researcher in me definitely thanks publisher, McClelland & Stewart, for investing money into an index. All in all this is a solid book given the shortage of reference material to work with. The author digs deep and nicely presents the long overdue look at one of hockey's greatest stars and most interesting people. Eddie Shore was the Babe Ruth and Ty Cobb of hockey, a brilliant player with an unmatched temper. Emerging from the Canadian prairie to become a member of the Boston Bruins in 1926, the man from Saskatchewan invaded every circuit in the NHL like a runaway locomotive on a downgrade. Hostile fans turned out in droves with a wish to see him killed, but in Boston he could do no wrong. During his twenty-year professional career, the controversial Shore personified "that old time hockey" like no other, playing the game with complete disregard for his own safety. Shore was one of the most penalized men in the NHL, and also a perennial member of its All Star Team. A dedicated athlete, Shore won the Hart Trophy for the league’s most valuable player four times — a record for a defenseman not since matched — and led Boston to two Stanley Cups in 1929 and 1939. In 1933, Shore was the instigator of hockey’s most infamous event, the tragic "Ace Bailey Incident," and during his subsequent sixteen-game suspension the fans chanted, "We want Shore!" After retiring from the NHL in 1940, Shore’s passion for the game remained undiminished, and as owner and tyrant of the AHL Springfield Indians, he won championship after championship. This is an action-packed and full-throated celebration of the "mighty Eddie Shore" — and also of the sport of hockey as it was gloriously played in a bygone age. MICHAEL HIAM was born in 1962 in Boston and came of age as a hockey fan at the height of the Bobby Orr era, when there were no Bruins tickets to be found. As an undergraduate, however, he both played hockey and attended as many Bruins games as he could. Today, Hiam is a licensed psychologist in New York and Massachusetts, and has authored and co-authored a number of scientific articles. In 2006, his first book, a biography of a CIA analyst active during the Vietnam War, Who the Hell Are we Fighting? The Story of Sam Adams and the Vietnam Intelligence Wars, was published by Steerforth Press. Today, Hiam lives in Newton, MA, with his wife and three children, and on Saturday mornings is an assistant coach for the Newton Youth Hockey Association.